Back to basics. 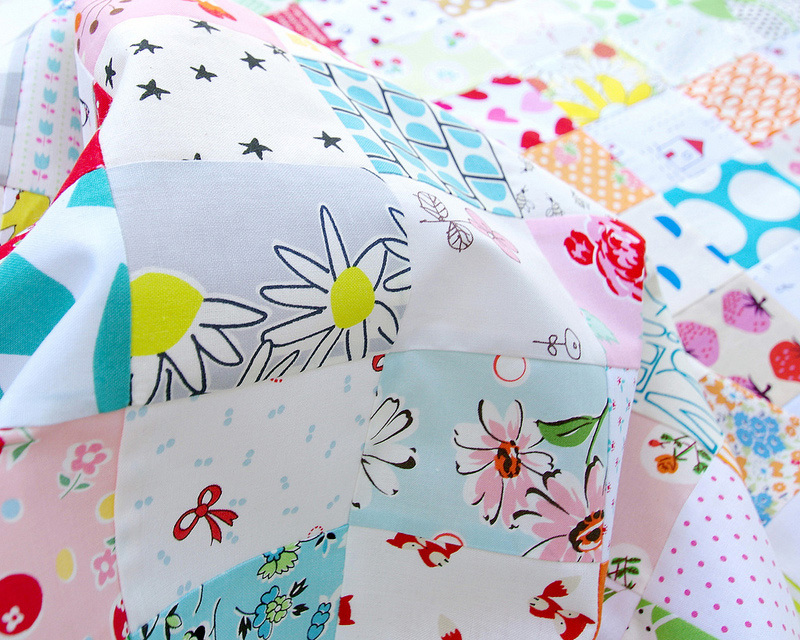 Simple patchwork, easy sewing, and busting both scraps and stash. 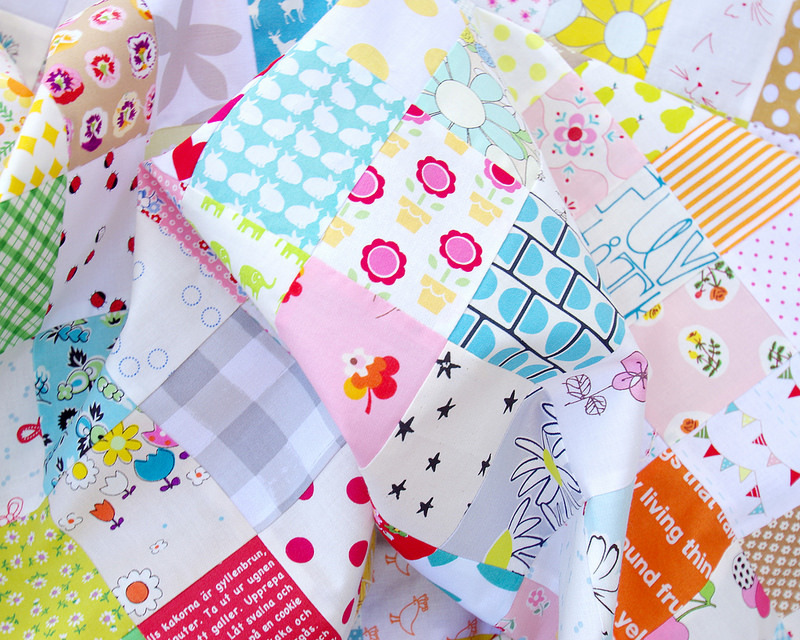 I love working with fabrics from my stash and this week I have spent a considerable amount of time digging deep into my fabric stash in search of the "favorites". 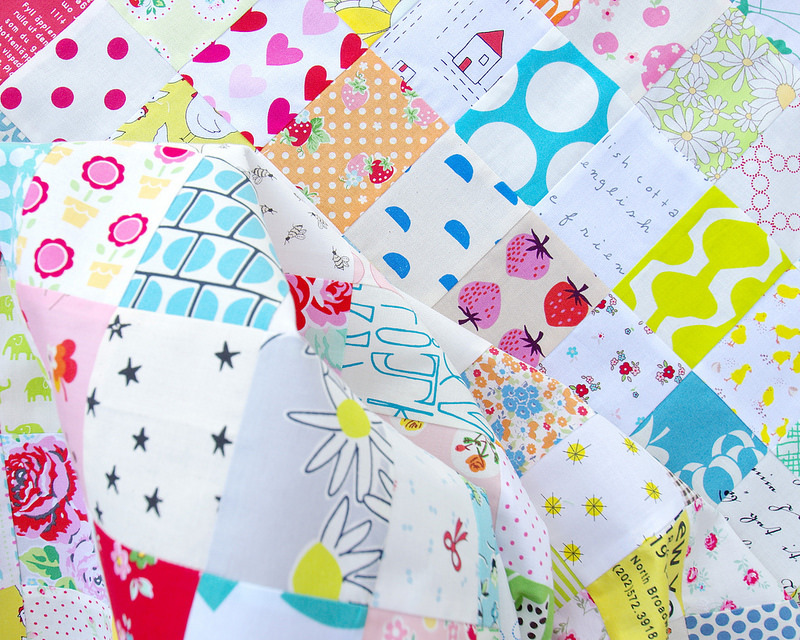 I have many fabric favorites and I have no problem jumbling all of these different prints and colors together. 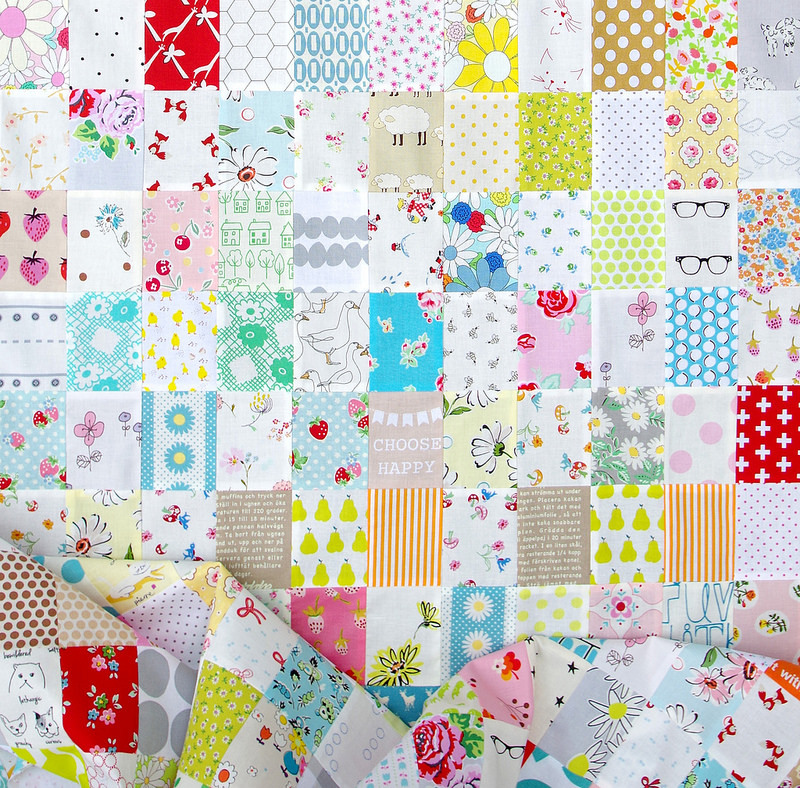 It's bright and colorful, but most of all pulling together a quilt like this makes me ridiculously happy. As with all of my Checkerboard Quilts I have contrasted a light, or low volume, fabric alongside a darker, more saturated in color, fabric. This quilt was strip pieced using the Checkerboard Quilt and Strip Piecing Tutorial, piecing a total of thirty-six 16-patch blocks. Most fabrics are repeated no more than 3 times and I did time some time to randomize the units; adding in the many individually fussy cut fabrics as well as taking strip sets apart to mix with others. 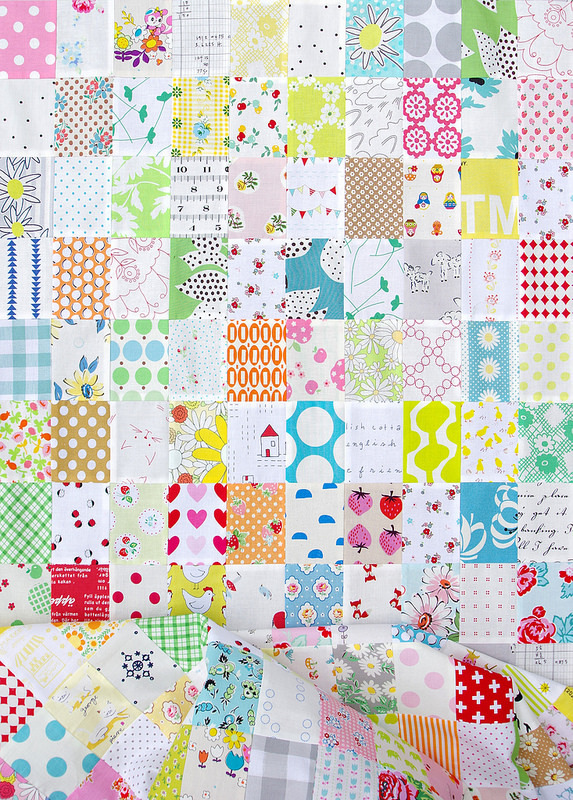 A selection of almost 180+ different quilting cottons make up this quilt. 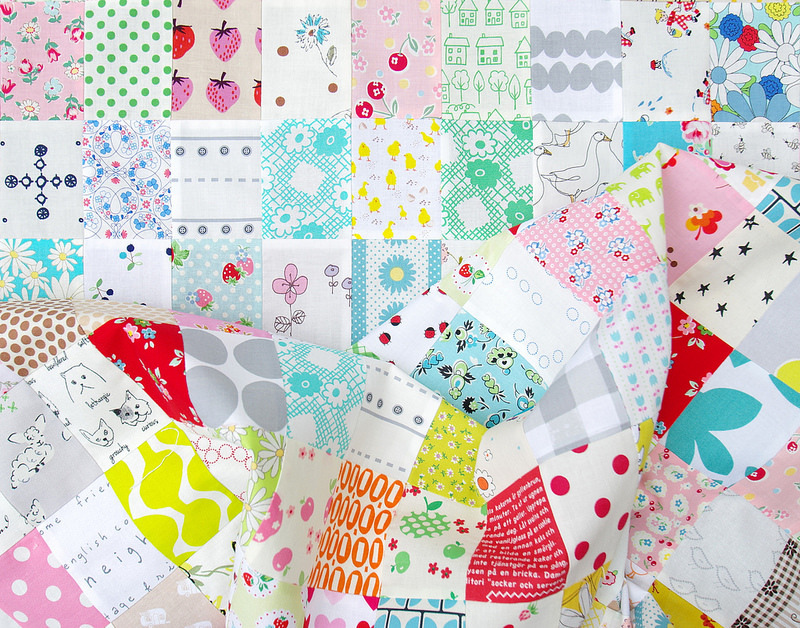 This quilt was strip pieced - see Checkerboard Strip Piecing Tutorial. 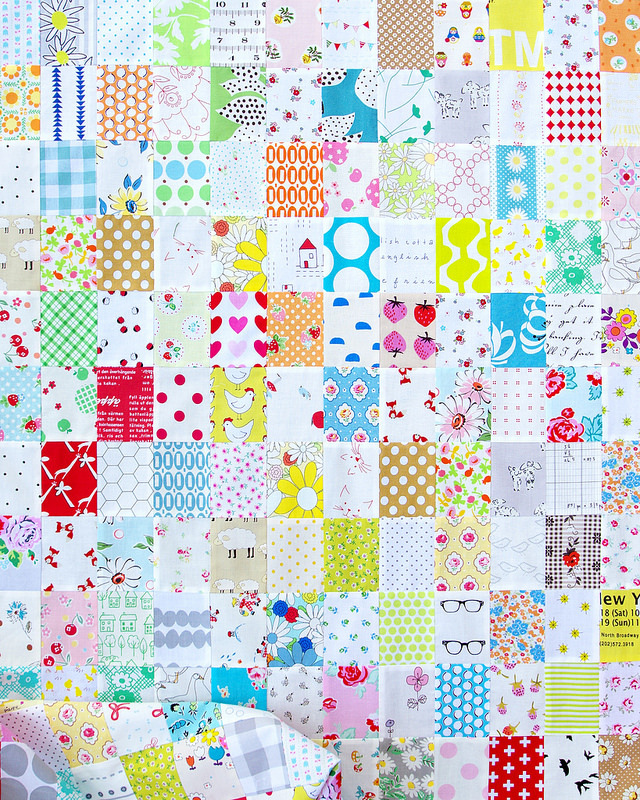 I made 36 16-patch blocks :: a total of 576 patches of fabric. 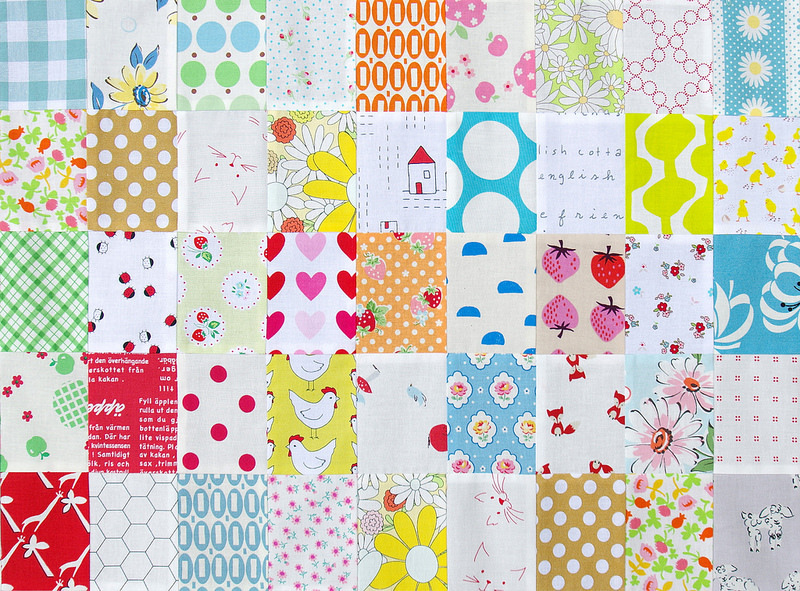 Each 16-patch block measures 9.5 inches x 12.5 inches. 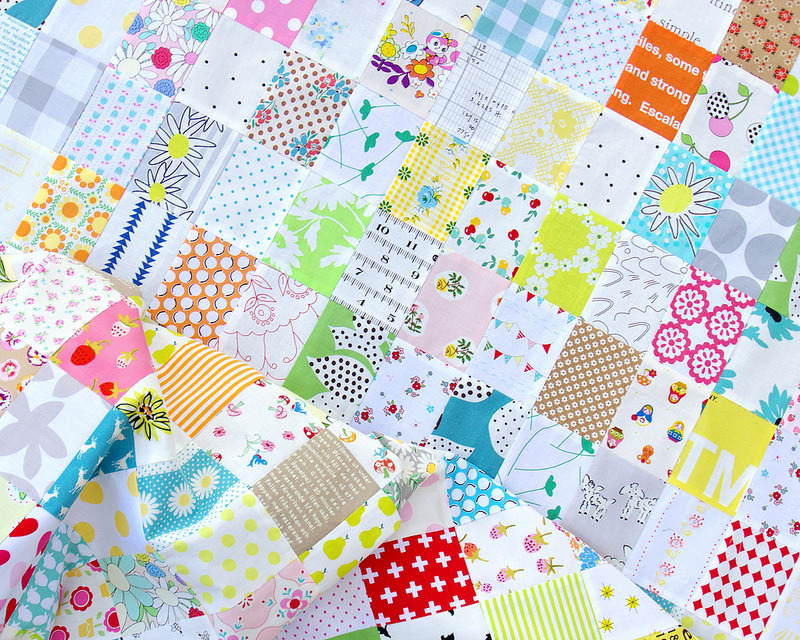 Each finished rectangle measures 2.25 inches x 3 inches. Quilt top measures 54.5 inches x 72.5 inches. 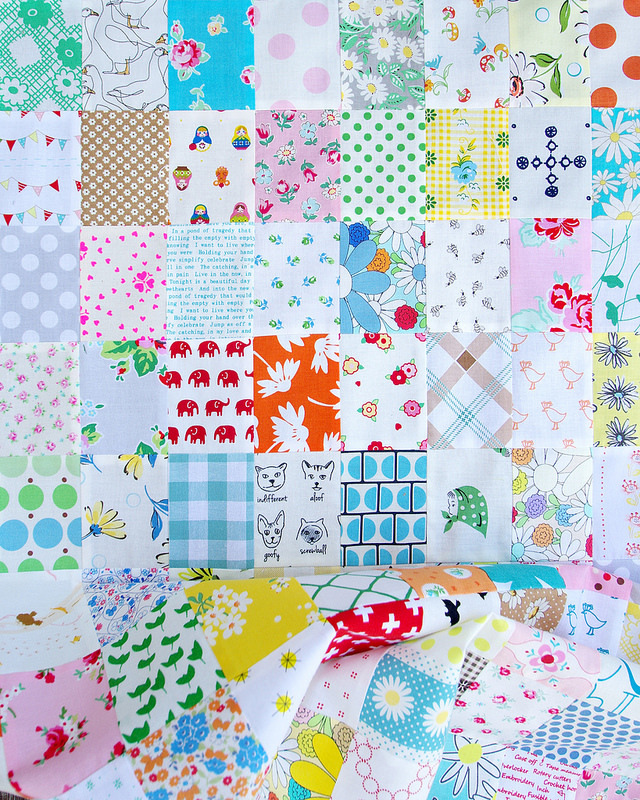 I love how this came together; a modern I Spy Quilt of sorts with various fabrics featuring items that may draw attention (like birds, cats, chickens, deer and ducks, as well as fruits, faces, and the many flowers. Strawberries in various colors and sizes feature often! Ready for basting and quilting. 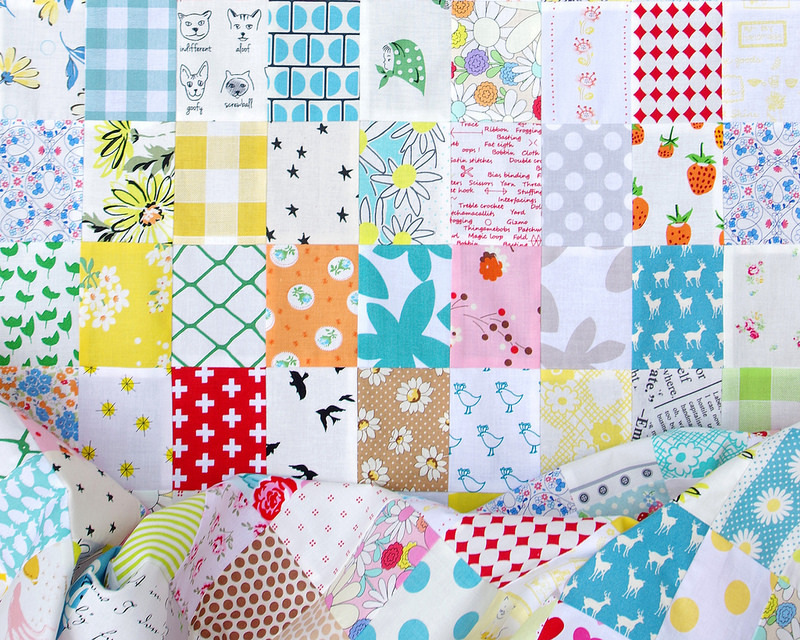 Now that is a Happy-Making Quilt. Thanks for sharing! Such a happy combination!!! Well done. 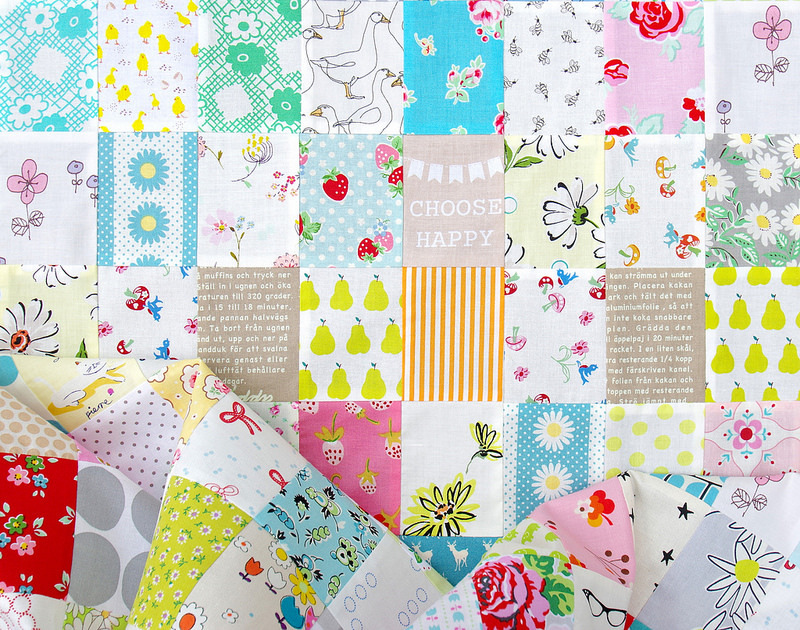 This is such a cheery quilt. 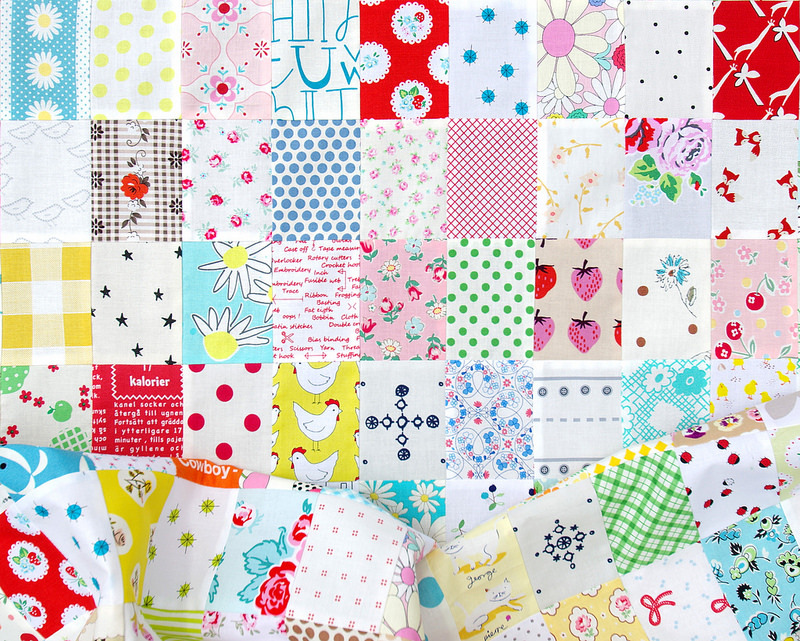 I'm going to have to make one of these with my scraps. Thanks Rita! Rita, another beautiful job. 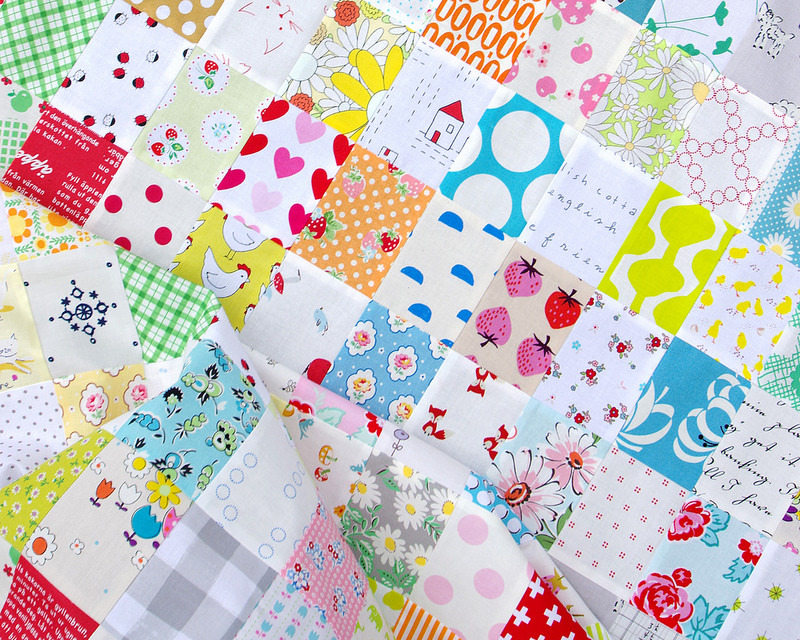 Your quilts always make me smile and wish I had the scrap and the talent to creative one too. I love the low volume light colors. This looks sweet.